New Year’s Resolutions: Where Are You in Meeting Your 2015 Goals? Can you believe it? It’s now February. You are now almost a month into the spring semester. A month into your new classes, a month closer to graduation, and, for us graduate students out there, one month closer to obtaining your master’s, doctorate, or professional degree and entering the job market. You are now also a month into the New Year and potentially a month into your New Year’s Resolutions. Most of us do it. Actually, in a recent survey conducted by CheapFlights.com, over 60% of Americans reported that they make New Year’s resolutions. Resolutions to eat healthier foods, work out more, quit smoking, spend more quality time with friends and family, and resolutions to get organized, keep up with course readings, and get better grades. These are all great goals to work towards; however, we may not always stick with the goals long enough to meet them. Typically, almost all people (around 90%) are able to practice their New Year’s resolutions for a week but only about 70% of people stick with their resolutions for a month or longer. That leaves 1 out of every 3 people less likely to still be working on their New Year’s resolutions right now. But don’t fret! There are easy steps you can take to make sure you fall into the 70% instead of the 30%. Before jumping into how to stick to your New Year’s Resolutions, let’s consider how to effectively set goals. S.M.A.R.T. 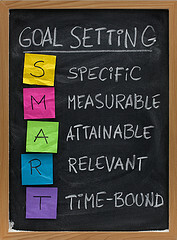 goals are goals that are Specific, Measurable, Attainable, Relevant, and Time-bound. An example of a S.M.A.R.T. goal or resolution would be “I will go to the gym for one hour three times a week for the next four weeks.” The goal is clearly defined, measurable (three times a week for one hour each day), it is realistic, it matters to me, and I’ve set the time frame for my goal to four weeks. Using this strategy makes it more likely that you will both stick to your goals as well as achieve them. 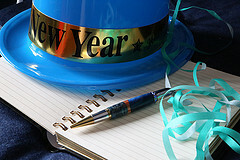 As time passes, it’s easy to lose sight of why New Year’s resolutions were ever made and why they are important to you. When you’re struggling to find the time and energy to go to the gym and cook balanced meals, it may become more difficult to keep in mind why eating healthier and exercising more were important to you before the New Year. Maybe there’s a pair of jeans you want to fit in, you want to have more energy, or there’s a special event coming up in a few months when you want to look and feel your best. Having physical reminders of your goals and the motivations for achieving those goals are a helpful way to keep yourself on track with your resolutions. 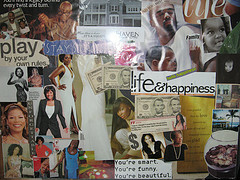 This can include making inspirational boards—a creative way to visualize your goals and stay focused on why you set them in the first place. Telling yourself that you are going to be better organized this semester is one thing—having others remind you of that resolution is something different! This is where a good support system comes in. Having friends and family either remind you of the resolutions you had set back in December OR working along side you to meet those goals is an excellent way to keep you accountable. You’re less likely to break those resolutions if you have someone who cares about you reminding you of your goals. With these steps, you cannot only make it pass this one-month mark—you can incorporate these short-term changes into your regular habits, turning New Year’s resolutions into lifetime behaviors. Previous Article Got an Interview? Check Out These Tips!